Arid lands across the globe are being impacted by water shortages that are having grave economic consequences. In the arid west of the United States, this is causing a conflict between cities and agricultural entities which are competing for the same water! At the same time, arid soils have been compromised due to common management practices and therefore are not functioning at optimum capacity. As a result, these soils provide relatively low levels of water and nutrition to vegetation. These compromised soils lack or are deficient in Mycorrhizal fungi and Humic substances; both Mycorrhizal fungi and Humic substances greatly increase a soils capacity to hold water and a plant’s ability to uptake nutrients. If we do not restore compromised arid soils, we cannot maximize crop success nor the conservation of water in arid lands of the Western United States, nor anywhere else on the globe. Mycorrhizae associate with roots and help improve the uptake of water and mineral nutrients from the soil, particularly during times of drought or when soil pH decreases mineral availability. “Developing agricultural practices using the fungus as an inoculum could help bring back low-input agriculture and enable cultivation of arid or semi-arid lands because the fungus promotes drought resistance in the plants it colonizes” said Dr. Lammers of New Mexico State University. Humic substances, containing Humic Acids, are complex biologic chemicals, which are prevalent in healthy top soils. Humic substances are incredibly hydrophilic (water-loving), they significantly increase a soils Cation Exchange Capacity (CEC) and they contribute to macroaggregate formation. Combined these benefits convert arid soils, which more than likely are not providing sufficient water nor nutrients, into a soil which provides abundant nutrients and water. This image illustrates 3 of the essential components of a healthy soil. Macroaggregates - the large brown clumps. Form when Humic substances are present in a soil system. Pools of water - water will penetrate and remain in a soil system when macroaggregates are present. Mycorrhizal Fungi - are represented by white lines which look like roots, because they are essentially an extension of the plants root system. Mycorrhizal fungi aid in macroaggregate formation. I've attached photos of cotton production in Arizona, on a site that had serious salt problems. These photos show the dramatic affects of the Supramolecular Humic Acids, when we treated with 2000 pounds per acre rate (Ag Grade TerraPro). 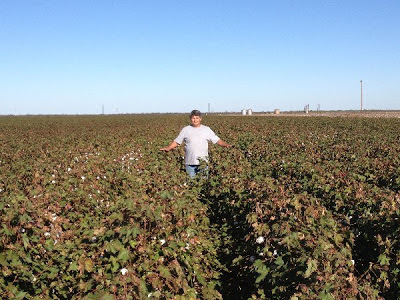 This photo shows the cotton production increase with the total treatment. We were able to increase production by 70%! WOW! This field historically produced significantly less than adjacent fields, due primarily to salt damage and soil type (sand). After treatment with 2,000 pounds/acre of TerraPro the field demonstrated a 70% increase in production. Increased production (number and size) seen in cotton bolls. 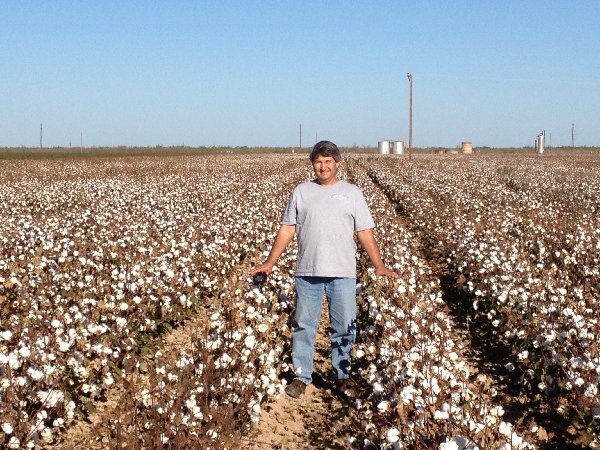 This cotton field contained an area, 25' x 50', which was highly contaminated with salt. The area to the left of the tall stake treated with 2,000 pounds/acre TerraPro and Endomaxima. Photos and data provided by John Miller with Spec International. For more info please email John, specintlinc@aol.com, or Soil Secrets, info@soilsecrets.com. I visited a cotton grower in Texas this past week who wanted me to visit his fields and see the success he was having using Agriculture Grade TerraPro. He stopped watering in early September, using buried drip irrigation, but the field treated with our TerraPro's Supramolecular Humic Acids has continued to grow and produce a higher percentage of cotton than the field treated with just EndoMaxima (mycorrhizal spores). 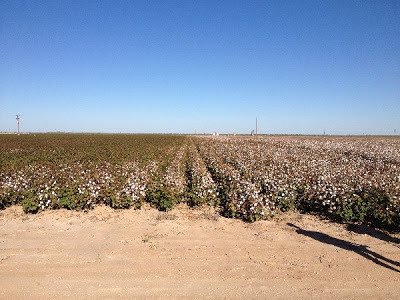 Both areas were treated with EndoMaxima and the field showing the main production increase is the TerraPro treated field where he used about 850 pounds per acre of the granulated product. The following photos show me standing in the field, using the oil battery tanks in the background as reference. Note that one photo shows both fields side by side, same seed type, same planting date and same irrigation timing. The only difference is the TerraPro! Soil Amendments are defined as any material which is added to a soil, in order to increase plant growth and improve plant health. Water - It important to remember that water must first penetrate a soil and the quality of water will dictate how well the water can penetrate. Rain water is better at penetrating the soil than hard well water, because rain water does not have the concentration of minerals that well water does. This concentration of minerals is measured as hardness of water. Because of the mineral hardness of well water there is higher surface tension, limiting the water's ability to penetrate the soil. A healthy soil will retain water for a much longer period of time and buffer higher pH levels than an unhealthy or depleted soil. Humic Acids play a huge role in water retention, because a single molecule of Humic Acid (if Supramolecular) can hold over 10,000 molecules of water. Humic Substances - Humic Substances are complex Carbon compounds found in soil. They sometime, but not always, contain active fractions call Humic, Humin and Fulvic. The common term for Humic Substances is Humus, often confused with compost, mushroom compost and peat moss. Humates are often sold as a source of Humic Substances and Humic Acids. Humates are an ore, more properly called Oxidized Lignite. Lignite is coal, oxidized means it is not useful in a power plant. However, Humates are not able to associate with water. Soil Secrets with the technical assistance of the National Labs has performed the only molecular analysis and characterization study of Humic Acids, which has allowed us the ability to formulate a Humic Acid product that works, because it is capable of associating with water and functioning with Supramolecular capabilities. For more detailed information see our blog on Carbon Compounds . Mycorrhizal Fungi (Mycorrhizae) - Mycorrhizal fungus improves a plants ability to get water and mineral nutrients out of the soil, while also protecting the plant roots from disease and from damaging nematodes. It's important to make sure that the mycorrhizal product is applicable to your objective, agricluture versus home and garden. For this reason we ask our clients to compare the products living spore count per pound and ask for 3rd party lab guarantees. For example, EndoMaxima® a product of Soil Secrets contains 1,450,000 living spores per pound! For more detailed information see our blog on Soil Structure . Minerals - There are 19 minerals which have been classified as essential for plant health. In order for a plant to sequester any mineral, the mineral must be in a soluble form. Humic Acids and Mycorrhizae help in this process. Fertilizers - While not officially recognized by government agencies as a soil amendment, fertilizers can provide the many major and minor nutrients of plant nutrition*. A fertilizer is defined as any product that contains the major and the minor nutrients at measurable levels by qualified labs. This can include acid-based chemical fertilizers, as well as compost. While a bag of chemical fertilizer can green up your lawn, or increase your crop yield, you're compromising the future health of the soil. Fertilizers, if used at typical prescribed label rates, are detrimental to the biological health of soils. This includes, using high levels of compost, for example good compost made properly will average about 2% Nitrogen. Therefore, a crop needing 100 pounds of Nitrogen per acre can be satisfied with just 5,000 pounds of compost spread over the entire acre. * Fertilizers are label approved under the Fertilizer Act, not the Soil Amendment Act. Composts - A quality compost is a difficult product to manufacture. It is said that when a compost is aggressively manipulated - when the pile is turned regularly and rapidly heated - that compost will be bacterial dominated. A static pile, which is not aggressively manipulated, rarely turned and kept on the dry side is said to be fungally dominated. All this really means is that a heated compost pile is decomposed by bacteria, while a static pile is decomposed by molds and saprophytic fungus similar to what you find on a forest floor. What really matters is the fertilizer nutrient value of the compost. Compost is primarily nutrients and rapidly decomposing (labile) carbons. Since compost does not have a significant level of the recalcitrant carbons of Humic Acids it is difficult to claim that compost is a soil builder. Compost Tea - While officially recognized as a soil amendment, by most state regulatory agencies, compost tea is actually more of a fertilizer, because compost tea does not have enough technical substance to be able change the structure of a soil. However, it does contain in solution the many trace minerals needed by plants. As a foliar spray containing these nutrients, plants can be easily satisfied, therefore improving the overall vigor and health of the plant. Earth Worm Castings - An organic fertilizer, excellent for use on delicate plants. In the healthiest soils earth worms are present, they digest organic matter and leave castings which become available for plant use. However, worms will not inhabit a depleted and/or compacted soil. In this case, worm castings can be added to the soil surface. In the Chihuahuan Desert of New Mexico, Trans Pecos Texas and Northern Mexico, we have many mountain ranges that have an ecotone at the base which I call the Desert Edge Woodland. It's very arid, dominated by Quercus species and averages between 12 and 15 inches of annual precipitation, rarely higher. 50% of precipitation falls during the summer monsoon season which is not much when you consider that the daily evaporation rate can exceed 1/2". Despite the aridity the oaks in this ecotone can still reach 40 feet tall or larger and you might assume that when grown for landscaping that these same species could tolerate the same 12 to 15 inches of annual moisture, however they cannot. Under cultivation the Chihuahuan Desert Native Oak will most likely need about 20 to 30 inches of annual moisture supplemented if planted in Albuquerque, Tucson, El Paso or Las Cruces. Nothing close to the 12 to 15 inches of its native counterparts. The reason for the lack of the same hardiness and low water tolerance of the cultivated plant versus the wild plant is that the cultivated plant lacks the full ecology of the terrestrial biosphere including a pipeline of Supramolecular Humic Acids and a Mycorrhizal relationship. Abstract: For a Lecture to be given by Michael at the Univerity of Bordeaux Conference Center in Bordeaux, France. The study of plant ecology is complex, for which the question of fluid dynamics and nutrient uptake presents many questions for those of us interested in growing plant material. It’s particularly relevant in situations such as agriculture, urban horticulture, erosion control and brownfield remediation, where jump starting the biology and manipulating the chemistry of the soil is sometimes essential for sustainable success. Water flows up into the organism, transporting soil minerals that are somehow purified into elements. Many of these elements, in the case of crops, are hauled away from the site when the crop is sold, while some are re-mineralized back into the soil in the form of decomposing organic debris. If all goes well, healthy soil, biologically rich in mutualistic microbes and recalcitrant carbons, is the result and we have Pedogenesis (the formation of top soil). For many decades, urban landscapers, horticulturists, farmers and agronomists have utilized the balanced fertilizer concept of N-P-K with a few minor plant nutrients thrown in from time to time. Fertilizers were formulated to stay in a soil water solution for as long as possible, so that plants had a chance of utilizing them. However, once the nutrients were left high and dry, they often complex with other mineral compounds in the soil and are no longer soluble for future use. For the objective of increasing the yield of an annual crop, fertilizers worked very well, however they did so at a cost to the biological health of soils. Modern urban horticulture and agriculture use N-P-K fertilizer inputs at levels that contraindicate Nature’s Bio Geo Chemical process a situation that is not sustainable and which is causing a degradation of soils on a global scale. This ‘brute force’ paradigm, causes chaos and death within the terrestrial biosphere, ultimately causing the soil to lose the pipeline of Humic Acids (the active supramolecular fractions of humic, humin and fulvic acids) formation. Humic acids are products of soil chemistry that are essential for any healthy and productive soil and the optimum water and mineral nutrient uptake of most plants. While the theme of each conference may be unique, the subject of soil and how to manage the biological health of a soil is still significant and needs to be discussed. The problem of soils can be exemplified by what’s happened to our food quality and nutrient density over the past few generations. Several studies show some shocking findings: A Kushi Institute analysis of nutrient data from 1975 to 1997 found that average calcium levels in 12 fresh vegetables dropped 27 percent; iron levels 37 percent; vitamin A levels 21 percent, and vitamin C levels 30 percent. A similar study of British nutrient data from 1930 to 1980, published in the British Food Journal, found that in 20 vegetables the average calcium content had declined 19 percent; iron 22 percent; and potassium 14 percent. Yet another study concluded that one would have to eat eight oranges today to derive the same amount of Vitamin A as our grandparents would have gotten from one orange. There are many more studies coming from all regions of the globe showing the same decline in the density of vitamins and minerals found in our food, including the food produced on organic farms. There’s no doubt, the soil of our Earth is in a crises and the simple act of throwing compost and fertilizer at the problem does not fix what we are dealing with. For more information please contact Info@soilsecrets.com . Here is a very interesting link on plant nutrition: Dirt Poor: Have Fruits and Vegetable Become Less Nutritious? Related Blog: The World Has Problem: The Cascading Failure of Soils! 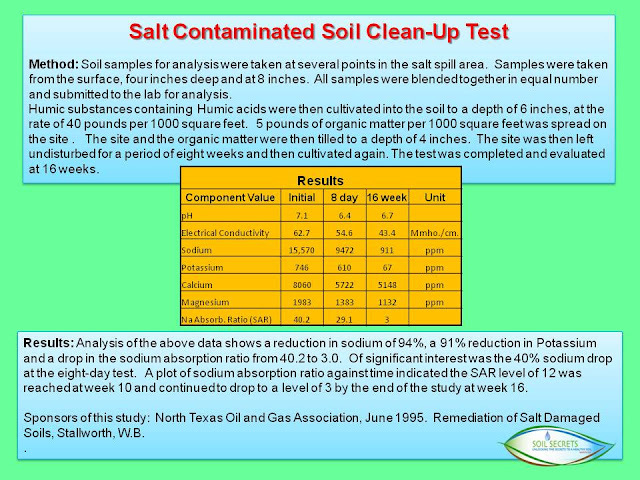 salts, so the proportion in the soil of salts gradually increases to a point of toxicity. amendments in the form of raw manure or compost and from acid based fertilizers. analysis of Humic Acids or their molecular characterization and functionality. the attached Abstract on the subject. in problematic Sodic and Saline soils. of tomato in the greenhouse. Here are a number of scientific abstracts which cover Mycorrhizal effects on plant root growth. Please post a comment if you are interested in finding additional information. LANSAC AR; MARIN A; ROLDAN A. 1995. MYCORRHIZAL COLONIZATION AND DROUGHT INTERACTIONS OF MEDITERRANEAN SHRUBS UNDER GREENHOUSE CONDITIONS. ARID SOIL RESEARCH AND REHABILITATION 9: 167-175. LANSAC AR, CSIC,CTR CIENCIAS MEDIOAMBIENTALES,SERRANO 115 DUPLICADO, E-28006 MADRID,SPAIN. Juvenile plants of Thymus mastichina, Thymus zygis, Lavandula pedunculata, Genista hirsuta, and Cistus ladanifer were transplanted from the field to the greenhouse; the soil used was the same in which they had grown at their natural site. The plants were grown to maturity to determine comparative growth, water status, and mycorrhizal colonization under greenhouse conditions and to determine the influence of drought on the symbiosis. After 24 months, L. pedunculata showed the most developed root system; G. hirsuta showed the lowest root/shoot ratio and the lowest percentage of mycorrhizal colonization. This percentage ranged from 32.0% to 82.4% for G. hirsuta and L. pedunculata, respectively. There was a positive relationship, between root biomass and root/shoot ratio with mycorrhization percentage, and a positive response of water potential to that percentage also occurred. After a moderate drought treatment over 4 weeks, increased mycorrhizal colonization percent and root biomass was related to with decreased plant moisture stress. The ectomycorrhizal symbiosis between C. ladanifer and Laccaria laccata appeared to be more severely affected by hydric stress than the endomycorrhizal symbiosis of the rest of the shrubs. This should be considered when this symbiosis is to be established in Mediterranean regions. The following 3 pictures show an increase in root mass in a Barley crop grown in Arizona. The barley was treated with Humic Acids and inoculated with mycorrhizal spores. The plants with the larger root system are from the treated fields. These photos were taken by the farmer who grew this crop. Barley on the right not treated! Barley on the left treated with Mycorrhizae. Barley grown in the Arizona desert. The next 2 photos show a successful erosion control project on the median of Highway 93, near Hoover Dam. Notice the lack of vegetation on the untreated hills bordering the highway; this site is brutally hot and dry. As expected the mix of native wildflowers germinated nicely and is now the greenest place around. The hyper-hydrophilic nature of the Humic Acids, plus the improved water uptake of plants because they’ve been made mycorrhizal, accounts for the instigation of sustainable vegetation. Soil macroaggregates create a soil structure which is permeable (by air and water) and stable (resistant to compaction and erosion). Soil aggregates result when Mycorrhizal Fungi bind soil particulates together. To be more specific Mycorrhizal hyphae, or filaments, are responsible for increasing a plants overall root mass. 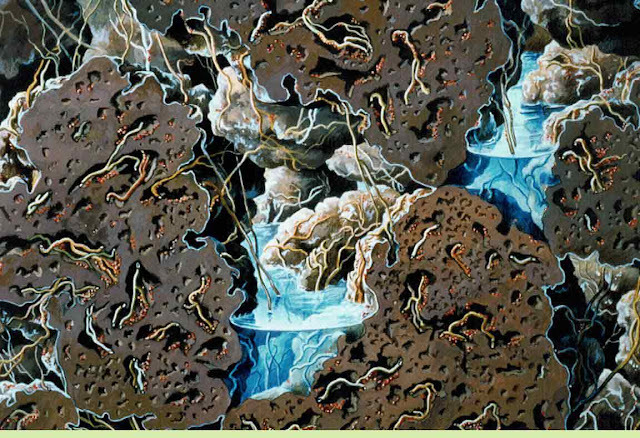 These hyphae extend throughout the soils surrounding a plant, and in their search for water and nutrients end up binding soil particles together. As hyphae die and begin to decompose they release Glomalin into soil systems. Glomalin is a glue-like protein which significantly increases aggregate formation, by gluing organic matter to soil particles. This process, of binding Labile carbons (as you recall, organic matter contributes to the Labile Carbon pool) to soil particles, traps these rapidly decomposing carbons in the soil; thereby storing them for future use and preventing these carbons from being released into the atmosphere. Humic Acids have been shown to increase aggregate formation. Please see Level 2 - Carbon Compounds for a detailed description of Humic Acid's role in aggregate formation. When Humic Acids combine with clay particles, we get the Humus-Clay Domain where most of the Nutrient holding and water holding capacity of the soil takes place! Once these aggregates have been formed, as a result of both Mycorrhizae and Humic Acids, water and air can easily penetrate the soil. Macroaggregates can also be described as Water Stable Soil Aggregates. The term Water Stable Soil Aggregate can be a bit confusing. First of all, "Water Stable" means that a soil which contains water stable aggregates will not collapse when water enters the system (these aggregates remain in tact during a slake test, which is a measure of the disintegration of soil aggregates when exposed to rapid wetting); as compared to a soil which does not contain these water stable aggregates and will collapse, thereby preventing water from penetrating. Once you have fostered the creation of water stable soil aggregates, water can enter the systems and form small pools in the aggregates. These pools hold moisture, gases, bacterial colonies and labile carbons, all of which increase soil and plant health. This image shows a macroaggregate (on the left) holding its structure during a slake test. 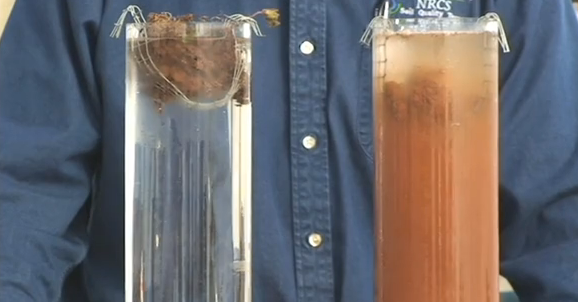 The cylinder on the right does not clearly illustrate how a compacted soil will prevent penetration of water, but it does show how much soil will be lost as water runs off a compacted soil. Tilling of soil will destroy these structures, increase erosion and create soil compaction. Tilling of soil reduces stability, by destroying the structural web created by Mycorrhizal hyphae. Tilling destroys worms passages and other structural spaces created by soil organisms. Worm passages are tunnels which help the soil breath, by letting in water and oxygen and releasing other gases. Please see No Till and Water for interesting information on this topic. Please follow this link for more detailed information: NRCS Water Stable Soil Aggregate Handbook . Please see the following Power Point No Till and Water, by Mark Scarpitti. Recently I was in an Albuquerque retail nursery where a fertilizer was being sold that stated it was formulated for alkaline soils of the Southwest. It contained high levels of iron and sulfur, plus the N, P and K major nutrients. Do any of the readers care to comment on this type of product? Pros, Cons, etc. I have my take on it, but I'll entertain what you want to say about it. The Labile Carbon is also known as the 'Rapid Cycling Carbon' and its composed of all the Soil Organic Matter that is dead and actively decomposing. It's benefit to the soil is that it provides a source for minerals that are being recycled as potential plant nutrients, so in a sense it's Nature's fertilizer. Active Carbon also known as Reactive Carbon is more complex than the Labile Carbon in that its composed of all the dead and actively decomposing organic matter plus all the living soil microbial community that will eventually die and begin decomposing. For example, the hyphae of mycorrhizae only live about 5 to 7 days before they die and start to decompose, while the fungus organism itself may live far longer. Recalcitrant Carbons are the Humic substances made up of complex organic chemistry, some of which is inert and some of which is very reactive and are powerful biologics, such as the Humic Acids. Recalcitrant Humic substances are known in laymen terms as Humus. These organic compounds are rich in carbon and made up of strong chemical bonds that resist breaking, therefore they persist in a soil for a long time. Clay particles and Humic Acids combine and make what is called a Clay-humus domain, which contributes to holding the soils structure together in macroaggregates. The Clay-humus domain also helps to hold the nutrients in a Cation Exchange Capacity format that keeps them available to plants at all time. Also helping to hold the macroaggregates together are the living roots and living hyphae of the plants and mycorrhizae along with the glycoproteins called Glomalin, a glue like substance leftover from the decay of the mycorrhizal hyphae. The significance of addressing the importance of living roots, hyphae and glomalin in the same breath as the Recalcitrant Carbons and Humic Acids is the issue of how tillage, plowing and rototilling damage the structure of soil. That activity kills the Active Carbon components of roots and hyphae, interrupting the production of glomalin, which combined causes a loss of macroaggregates, breaking everything down into microaggregates, which is not good! The Humic Acid molecule: Is what we need more of in our soils. Its a powerful biologic chemical of nature, a result of a chemical reaction in soil. They are found in greatest concentration in rich black top soils, where eons of time and perfect conditions of moisture and vegetation along with a healthy Soil Food Web have allowed them to be manufactured and concentrated. In the Journal of Chemical Education, 2001 article on Humic Acids, its said that "Humic Acids are essential for a healthy and productive soil", a significant statement coming from a journal of science. The image we show is a result of a collaborative effort between Soil Secrets and Femto Chemists retained for research by Soil Secrets. The image shows many six sided Phenyl rings of organic chemistry containing carbon as the backbone. The carbon will appear as green balls in each corner of the Phenyl rings. Before we did this work, the only model of a Humic Acid molecule was by Stevenson (1982), only theoretical, using the conventional stick and ball model. 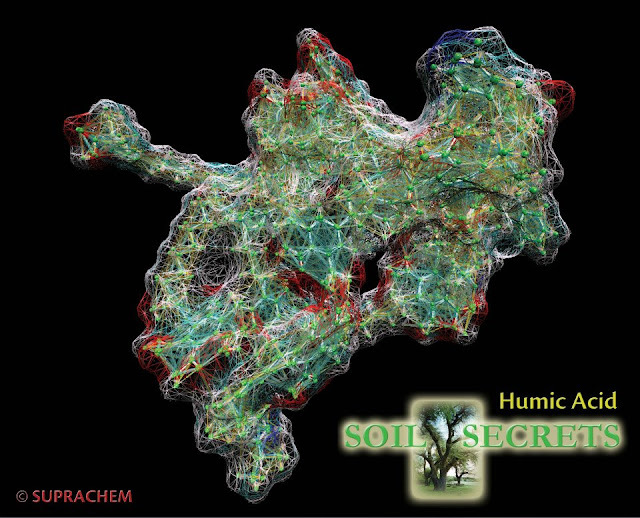 The Soil Secrets Humic Acid molecule was produced using femtojoule methods, which shows the subatomic structure of the molecule. Our femtojoule method is 15 orders of magnitude higher resolution than any other method of describing and defining the molecule of Humic Acid. This enables us to see and measure the strength of Supramolecular (non-bonded) interactions where others can only infer such interactions from rules of thumb. In other words, while others are guessing how and why a Humic Acid works, we have details and the best understanding to date of the molecular description, characterization and functionality of the Humic Acids found in our products and in soil. For more details on how Humic Acids benefit a soil, I suggest reading the ACRES USA article 'The Science of Humus' December 2009. Labels: "active carbon", "healthy soil", "Humic Acid", "labile carbon", "recalcitrant carbon"
Level 1 - This post is intended to introduce terms which describe the essential components of a healthy soil. This discussion is complicated, so we will provide increasingly detailed levels of information, at the risk of oversimplifying in the beginning. All plants, found on earth today, evolved to thrive in a soil system filled with variety. Ancestral soils teamed with organisms and carbon compounds, which supplied abundant nutrients and water. What does a varied soil system look like when compared to a conventionally managed soil system? Carbons which easily decay, such as those present in microorganisms, compost, crop residues, manures, and mulches. These materials release mineral nutrients back into the soil. Contains Humic Acids which are essential to a healthy and productive soil, Humic Acids are known commonly as Humus. Humic Acids endure the stress of time and will remain in an undisturbed soil for thousands of years. Humic Acids improve soil structure, for as long as they remain in the soil. Humic Acids increase a soils capacity to hold water more than any other soil component. Both Labile and Recalcitrant Carbon levels are often very low in conventionally managed soils systems, because the pipeline of their formation has been compromised. For more detailed information please read Changing Dirt Into Soil. Soil organisms, such as Mycorrhizal fungi, beneficial bacteria and earth worms, are absolutely essential in soil heatlh management. Mycorrhizal fungi greatly improve soil structure and nutrient uptake. Beneficial bacteria provide a wide range of benefits, including Nitrogen fixation. Earth worms contribute enzymes and decompose labile carbons. The diversity of microorganisms increases as vegetation types increase. The redwood forest soils of California, with their incredible diversity of vegetation, provide abundant fertilization as a result of this biodiversity. The lack of biodiversity, in conventionally managed soil systems, contributes to unhealthy and unproductive crops. Mycorrhizal fungi increase plant root mass and solubilize mineral nutrients. Humic Acids increase Cation Exchange Capacity (CEC), thereby storing mineral nutrients. Nutrient availability is greatly decreased when Mycorrhizal fungi and humus are not present. Please see our blog for more information: Understanding the Importance of Cation Exchange Capacity . Macroaggregates result when Mycorrhizal Fungi bind soil particulates together. Humic Acids have been shown to increase macroaggregate formation. Tilling of soil will destroy these structures, increase erosion and create soil compaction. Moisture must first be absorbed - water will penetrate soils when macroaggregates are present. Humic Acids and decomposing surface organic matter will then retain water which has penetrated an uncompacted soil. Water in conventionally managed soil systems frequently runs off without being absorbed. Mulches can be described as a decomposing surface layer which insulates and protects the soil from environmental stresses. This organic matter will eventually become part of the labile carbon fraction of the soil. Conventionally managed soil systems often lack even thin layers of surface organic matter. Please see Got Mulch? for more information. Our most precious natural resource, healthy top soil, is disappearing at alarming rates. For generations modern soil management practices have systematically reduced the diversity of soils, resulting in reduced yields. To compensate chemical fertilizers have been added, a costly and increasingly ineffective solution. Stay tuned for Level 2. The World Has a Problem: The Cascading Failure of Soil! Staff of Soil Secrets Responds to this story: The population of the earth is growing by approximated 86 million people per year, according to a recent National Geographic Special Issue; this is a net gain after accounting for population mortality. This means that on average 235,000 babies are born each day, which is 235,000 new mouths to feed every day. The USDA and food protection studies performed by Sandia National Laboratories have determined that according to our Ecological Footprint - 6 acres of land is required per person for annual food production, based on the standards of the United States. If the goal is to modernize the developing world to the same standard of living as the developed world, then the same Ecological Footprint would be needed for every person on the planet. Therefore, the 235,000 human beings added to this earth each and every day would require 511 million acres or 800,000 square miles (6 ½ New Mexico’s) of new agricultural land every year. This is an impossible quest and in fact the world is not gaining farm land but instead is losing agricultural land at an alarming rate! I see this as one of humanity’s greatest obstacles! Megan Carpenter addressed another concern, nutrient density, in her article Larger Fruits and Vegetables Mean More Plentiful but Less Potent Bounty. In this article, a biochemist with the University of Texas at Austin, Donald David, suggests that the fruits and vegetables currently sold in the United States show substantial deficiencies in 6 of 13 major nutrients. In collaboration with the USDA, Dr. Davis calculated a 38% loss in protein, calcium, vitamin C, phosphorus, iron and riboflavin when he compared fruits and veggies grown today to those same crops produced in past decades. What might cause this significant decrease in nutrient density? Dr. Davis insightfully concludes that as crops grow faster and yields increase - nutrient density declines. He suggests that the dilution of vital vitamins and minerals has occurred as direct a result of farmers being paid for the quantity of crop produced and not the quality. I found this article to be of upmost importance as we enter a time period when population growth, as mentioned above, is measured in exponential terms. However, this article does not address the single greatest influence on nutrient density – the biological health of the soil in which the crop was produced and the availability of water stored in the soil! Agricultural soils across the globe have been compromised due to conventional agricultural practices and therefore are not functioning at optimum capacity, have poor soil structure, and are not retaining water for crop use. As a result, soils in these managed and constructed landscapes provide relatively low levels of nutrition to vegetation, when compared to undisturbed soil systems. Healthy, or undisturbed, soil systems contain significantly higher levels of Mycorrhizal fungi and Humic substances; both of which greatly increase a plant’s ability to uptake nutrients. Modern conventional agricultural use of fertilizers and soil tillage damage both the Mycorrhizal plant relationship while causing a decline in the concentration of Humic substances in the soil! Mycorrhizea are a beneficial mutualistic fungus. They associate with over 95% of the plants in the wild and help improve the uptake of mineral nutrients and water for the benefit of the host plant. Science has demonstrated that crops that are not Mycorrhizal are in need of extra fertilizer and extra water assistance! Both significant issues when you consider that most of the agricultural land on earth is found in arid regions requiring supplemental irrigation. The mycelium hyphae (nutrient transport tubes) of Mycorrhizae lives about 6 days and it’s this organic biomass that contributes to the chemical production of Humus, the Humic substances of soil. Humic substances are complex carbon Supramolecular Substances, which are prevalent in healthy top soils with the Humic Acid fraction a powerful biologic chemical that’s perhaps the most important part of a healthy soil. “Humic acids (HAs) are remarkable brown to black products of soil chemistry that are essential for healthy and productive soil” Journal of Chemistry, Dec 2001, Vol. 78, No. 12. Humic acids and the whole Humic substance material is the recalcitrant (resisting decay) carbon of soil that is of critical importance in holding the soils structure together in ‘Macroaggregates’, reducing the compaction of soil while also improving the soils ability to retain water and mineral nutrients for vegetation uptake. On a bio-geo-chemical level, Humic acids are involved in hundreds of chemical equations, including but not limited to making the soil a healthier place for soil microbes, roots, and other members of the Soil Food Web community of the terrestrial biosphere. Humic acids are also involved in the process of making the minerals of the soil available for plant use, by solubilizing them from the complex chemical compounds that plants cannot solubilize on their own. As previously stated, Humic acids play a role in helping to retain water in the soil, therefore they also help in holding the plant nutrients in a water solution so that plants can absorb the minerals. Many agricultural professionals whom currently follow modern conventional practices are now showing a strong interest in using Mycorrhizal fungi inoculants and Humic acids to reduce inputs, and increase crop nutrient density. Growers operating Organic Certified farms are also starting to take notice of this science as they realize that adding manure and compost is not the solution to the real problem. While animal manures and compost can provide a fertilizer value, the organic matter of those inputs are rapid cycling and referred to as the ‘labile’ (temporary or fast changing) pool of soil organic matter, while Humic substances (also called Humus) is the ‘recalcitrant’ pool of the soil that plays a vital and essential role in the biological management of soil. Manures and compost are a poor source of Humic Acids! Humianity must overcome this obsticale and act aggresively to protect our most precious natural resource - SOIL! I was recently asked to provide a simplified explanation on the importance of Cation Exchange Capacity (CEC) values. CEC is the ability of a soil to hold onto plant nutrients. The finer the particle size the higher CEC value, generally speaking. For example sand particles are course and visible to the naked eye, where as clay particles are fine and are not visible to the naked eye. So clay will have a higher CEC value than sand. It is obvious to most of us that sand cannot hold onto water or nutrients as well as a soil with a finer texture. Therefore, soils rich in Clay and Loam size particles are universally recognized as being better for farming - CEC explains this. The numerical value for CEC represents how much nutrition can be held by a given amount of soil. For example one pound of a clay loam soil with a CEC value of 20 will hold 4 times as many nutrients as a sandy soil with a CEC value of 5. 20/4 = 5. It's all about math, for example Nitrogen in a cation form (not all nitrogen fertilizers are in a cation form) can be stored in a soil. Here is a simplified calculation - A CEC value of 20 can hold 200 pounds of cation nitrogen, 200/20 = 10. Where a sand with a CEC value of 5 can only hold 50 pounds of cation nitrogen, 50/5 = 10. Well decomposed organic matter may have a higher CEC value than sand or clay, but it is insignificant when organic matter represents a tiny percentage of the soil. See the attached chart on the potential CEC values of various substances! For example, if your soil is only 1% organic matter it does not contribute significantly to CEC values, when compared to the massive volume of the soil itself. This is often called the buffering capacity of the soil and is also related to any attempt to change the pH of the soil! On the chart you will notice that Humus and the organic matter of compost are not the same thing, as Humus is referring to the recalcitrant (persistent and resistant to decay) soil carbon substances that are powerful biologic chemicals containing the active ingredient of Humic Acids. These substances have a huge CEC value and are very significant when it comes to plant nutrient availability. If the Humic Acid is Supramolecular, the molecules are capable of amazing characteristics, including how they perform as a CEC factor. The best way to increase CEC is to increase Humic Acid levels in your soil. This is good because Humic Acids are part of the recalcitrant soil carbon pool, which is resistant to decay; meaning Humic Acids are capable of lasting thousands of years in an undisturbed soil. Where as organic matter is labile carbon, which is subject to rapid changes; because labile carbons are unstable they decay easily and disappear from the soil quickly. CEC may be the limiting factor for having a fertile soil. In order to improve the fertility of your soil when CEC is limiting you, add Humic Acids as the most effective tool. However, don't be fooled by "New and Improved" formulations of Humic Acids that claim you only need a few gallons or pounds per acre, as that's not how the math works and CEC and the ability to hold onto the hundreds of pounds of nutrients needed by a crop is all about math. Do Your Humic Acids have any Character? While Humic Acids may have a personality, what's really important is whether or not they work and how much of this active ingredient is actually in a given product. To determine this, Soil Secrets LLC, initiated a study to characterize the Humic Acid molecule found in our products. What do we mean by asking if a molecular substances has Character? The characterization process measures the geometry and the functionality of the targeted molecule, in this case Humic Acid. So what does this mean to our clients or to the staff at Soil Secrets? For us, it provides the evidence we need in order to talk intelligently and accurately about what the active ingredient is in our product. For the client, its proof that the active ingredient is indeed present in the product and that it does function in the way we claim it should. The "Characterization of the Functionality of the Humic Acids" found in our products was performed in collaboration with Femto Chemists and a contract for analytics performed by Los Alamos National Laboratory and Sandia National Laboratories. The two National Labs have the unique ability to purify a molecular chemical from a whole sample without damaging the target molecule, necessary before you can perform the true chemical analysis. No other commercial entity worldwide can produce this kind of evidence or efficacious study on their product! The reason they can't is because the type of analysis technique used by commercial and university soil labs is not standardized, lacks the ability to purify without damaging the molecule, and most lack the equipment for analysis or the library data base to interpret the results. If you would like to read more on this problem of analysis, contact us and request the paper: Supramolecular Advances in Agronomy 2002. Here's where we cannot be matched: While many companies claim to sell Humic Acids with new and improved formulations or even just raw Humate, they cannot prove that their product contains any given amount of that active ingredient. The science and methodology to purify, from the sample, the active ingredient of Humic, Fulvic or Humin is not available to any labs other than Los Alamos National Laboratory and Sandia National Laboratories. In typical labs, before these active ingredients are analyzed, they must separate them from the whole sample without harming them. Commercial or university soil labs cannot do that! 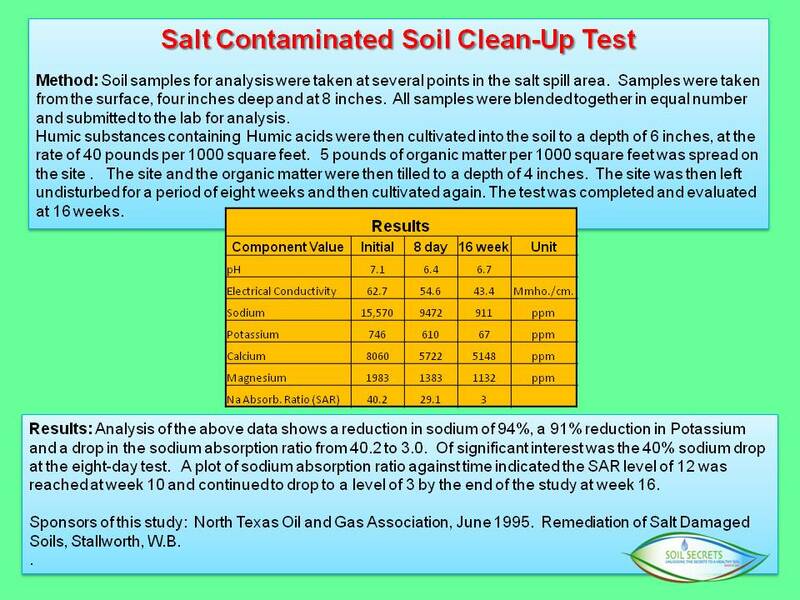 The standard method of separating the Humic Acid from the soil or soil amendment sample does not work because it's a caustic chemical reaction that destroys any active ingredient that may have been in the sample. In addition, there's no standardized method used by all the university or commercial labs for doing the analysis of Humic Acid, therefore the methods used are estimates only. How can our competitors claim that they have made a new and improved form of Humic Acid, if they cannot even measure what they've made? We however, have full detail of all the functional characteristics of the Humic Acid molecule found in our product, including a full profile of the Functional Groups attached to the Humic acid fraction of our TerraPro and Earth Ambrosia liquid. Let's be clear - We hang our hat on our Humic Acid products, because there is research to support them. This research will ultimately show how Humic Acids play an active role in plant nutrition and soil building. This is called the Bio-Geo-Chemical process of plant nutrient uptake and Pedogenesis.